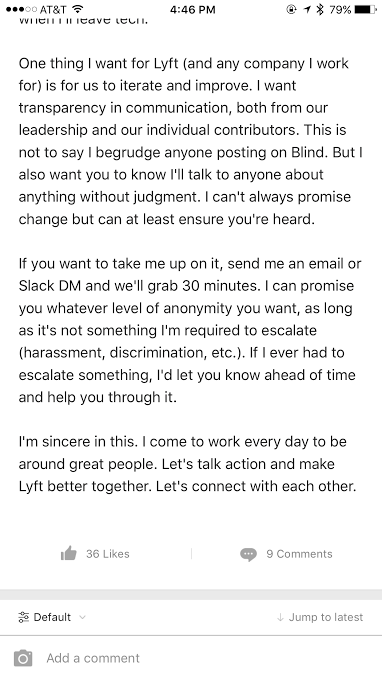 Lyft’s head of engineering Jill Wetzler has penned a heartfelt letter to her fellow teammates asking them to chat openly with her about any issues they may be facing in the workplace. To those who are either posting or lurking here: I want to offer up my availability to chat freely. I struggle with my own work/life balance, anxiety around compensation, and the conflict between feeling grateful for the many privileges I have while still wanting better from my peers, my company, and my industry. 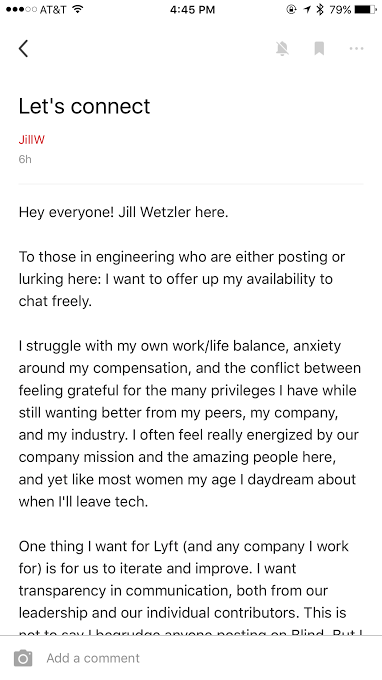 I often feel really energized by our company mission and the amazing people here, and yet like most women my age I daydream about when I’ll leave tech. One thing I want for Lyft (and any company I work for) is for us to iterate and improve. I want transparency in communication, both from our leadership and from our individual contributors. This is not to say I begrudge anyone posting on Blind. But I also want you to know I’ll talk to anyone about anything without judgment. I can’t always promise change but can at least ensure you’re heard. If you want to take me up on it, send me an email or Slack DM and we’ll grab 30 minutes. I can promise you whatever level of anonymity you want, as long as it’s not something I’m required to escalate (harassment, discrimination, etc.). If I ever had to escalate something, I’d let you know ahead of time and help you through it. I’m sincere in this. I come to work every day to be around great people. Let’s talk action and make Lyft better together. Let’s connect with each other. Lyft is seen as the softer, fuzzier counter to its ride-hailing rival Uber and it doesn’t take much to link this approach with the experience of former Uber engineer Susan Fowler Rigetti, who famously posted about being propositioned and discriminated against while working at the company. There have been some serious questions raised about Uber’s internal culture lately, particularly in this instance in the way it has treated women, and perhaps Lyft’s head of engineering hoped to head off the same sorts of issues. Tech, in general, has been notoriously bad at the way it treats and promotes women. Though Wetzler did not want to comment for this story, it’s clear that she has at least been concerned with being proactive about avoiding a culture of misogyny and fear. We should note Blind has also been an instrumental tool within both companies for employees to communicate issues on an anonymous basis. Though Uber banned using the app while on company grounds earlier this year, an Uber spokesperson says employees have access to it again, so perhaps it is also rethinking how it listens in when issues arise.